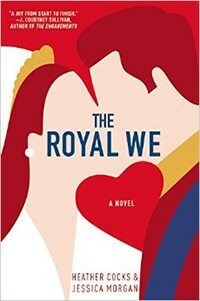 With one glimpse of the cleverly designed cover of The Royal We (young royal couple who bear a striking resemblance to Prince William and Kate Middleton, with a heart formed by the negative space between them), I was pretty sure I knew what I was getting into: a fluffy piece of chick-lit romance with a royal flavor. For better and for worse — haha — I was wrong about that. It’s also a story about friendship, family obligations, and the impossibility of privacy in our connected world. But don’t worry, it’s definitely also a roman a clef about the British royal family. Rebecca “Bex” Porter is an undergrad student at Columbia when she’s offered the chance to study abroad for a semester at Oxford. After all, England couldn’t be further from her native Iowa… and maybe, just maybe, she’s also trying to insert some breathing room in her intensely close relationship with her twin sister Lacey. As the laws of romance novels dictate, she instantly has a meet-cute with Nick, aka Prince Nicholas (aka Prince WIlliam to you). Nick is instantly charmed by Bex’s aw-shucks American-gal spirit, but his elite circle of friends swiftly close ranks to shut out the tiara-hungry outsider. But even after winning over the royal Scooby Gang, Bex will have to win the hearts of the tradition-bound royal family, to say nothing of the British public. And the higher her star rises, the more Bex gets an unwelcome introduction to the corrosive, ugly effects of privilege and power on all kinds of personal relationships. So how closely do these fictional royals match the real-life British royal family? Well, the reigning “Queen Eleanor” is the mother of “Prince Richard,” who married the glamorous but tragic “Lady Emma,” and they produced two sons, “Nicholas” and “Frederick,” who are next in line for the throne. So… pretty darn close. Through a slightly altered 20th-century history, the authors also avoid that unsightly abdication crisis and provide a more streamlined chain of descent. I’m not an avid enough follower of royal circles to know if the story’s fictional friends and hangers-on have real-life equivalents or if they’re inventions to serve the plot’s forward momentum. But ultimately, it doesn’t matter — it’s a highly believable depiction of the downside of celebrity. Many people mock 21st-century royals as underemployed, clueless leeches sucking up taxpayer money, but The Royal We shows that as national figureheads, they’re also constantly scrutinized, deprived of any conventional notion of privacy, and forced to question the motives of those nearest and dearest to them, which can’t be easy. Based on my subsequent research (i.e., watching the Lifetime TV movie about William and Kate), The Royal We follows the public timeline of the William-and-Kate courtship story, while also taking pains to show that the sugar-coated tabloid scandals we’re fed are a sensationalized, simplified, or falsified distortion of real events involving real people. You might even find yourself feeling some sympathy for the young royals who were assigned a highly visible, 24/7 PR job from the moment they were born, without any choice. Check out a free preview of the first seven chapters. And be glad there are no paparazzi peeping in your windows to see what you’re wearing!